As shown in Figure 30, higher-income children were consistently more likely to attend both full- and part-day preschool than lower-income children. Higher-income children’s full-day preschool enrollment increased from 25 to 29 percent from 1995 to 2011 while their part-day enrollment did not change. 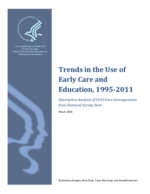 Conversely, there was increased enrollment in part-day preschool among low-income children from 18 to 22 percent, but no change in their full-day participation from 1995 to 2011.